We get quotes from multiple vendors to get you the best coverage and pricing for your budget. Having good oral health is an important part of a healthy lifestyle. People with dental insurance tend to go more regularly and have fewer problems with teeth and gums due to regular check-ups and cleanings. 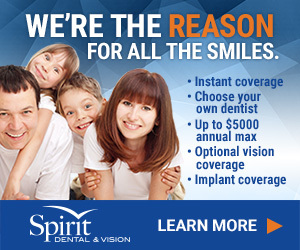 There are questions you will want answered when deciding dental plans. How many cleanings and exams are covered each year? Does the plan limit which dentist I use? Does the plan cover fillings, orthodontics, root canals, and crowns? Is there a deductible? Is there a waiting period on services provided? What can I expect to pay besides the premium? Dental plans have various differences in coverage. Some of the differences include but are not limited to choice of in-network or freedom to choose plans, limits on annual maximums of coverage, deductibles on certain services, and pre-existing clauses. Comparing plans and their features can seem confusing but guidance from a licensed insurance agent can help you find a plan that works for the client’s needs and budget. We are not endorsed by the Federal Government or the Federal Medicare Program. This is an advertisement for insurance. Neither Emery Insurance Services nor its agents are connected with the Federal Medicare Program. We offer plans through Spirit, Denali and Magnum. Have questions? Please call 1-800-658-9009.